Fantastic Beasts: The Crimes Of Grindelwald wastes no time at all ushering viewers back into the “Wizarding World” of Harry Potter. Those very words, in fact, appear right on the screen, in big letters, floating into view seconds after the Warner Bros. logo—sheening and monochromatic, to tease the stormier nature of the latest installment—does the same. The welcome mat is a reminder of what this supplemental franchise is ostensibly for: the promise of a longer glimpse beyond the walls of Hogwarts and the scope of one gifted kid’s saga, the opportunity to be transported to new corners (and eras) of a magic society. But the words are also a brand, the name for a whole media empire built atop J.K. Rowling’s kid-lit bestsellers, and The Crimes Of Grindelwald—the second of five planned trips to the pre-Potter timeline—is all about milking that brand for everything it’s worth. It’s less a necessary new chapter in this ongoing story than the movie-shaped equivalent of memorabilia, or maybe just an affordable multiplex alternative to whisking the whole family off to the Wizarding World area of Universal Studios. The first Fantastic Beasts did a little less milking, even if its entire existence was predicated on the certainty that fans would shell out for some inessential side adventures loosely connected to the main ones they loved. Adapted from a fictional monster manual (itself a successful exploitation of the brand), Fantastic Beasts And Where To Find Them was a busy diversion whose pleasures were mild and incidental: They mostly came down to how resident Potter director David Yates, working from a script by Rowling herself, cosmetically envisioned a 1920s New York of secret magicians, capering and casting just outside the perception of the muggles (or “no-majs,” in American wizard parlance) all around them. 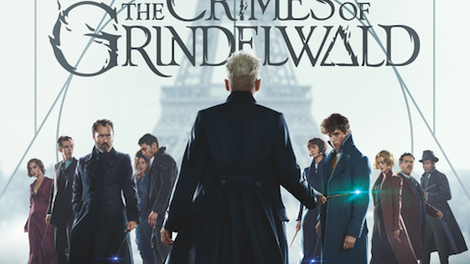 Trading frivolity for soapy melodrama, and resembling a full-fledged prequel as much as a spinoff, The Crimes Of Grindelwald might qualify as a heavier meal than its predecessor but that doesn’t make it a more satisfying one—at least for anyone seeking a better buzz than recognition of a callback. Rowling and Yates ended the last Fantastic Beasts with one such callback: the Scooby Doo reveal that the villain, played by Colin Farrell, was actually fabled dark wizard Grindelwald, now to be portrayed by one-man costume party Johnny Depp. Picking up six months later, The Crimes Of Grindelwald opens with its titular heavy busting out of American Ministry Of Magic custody during a botched transfer to British authorities—an aerial escape sequence more exciting in conception than execution. 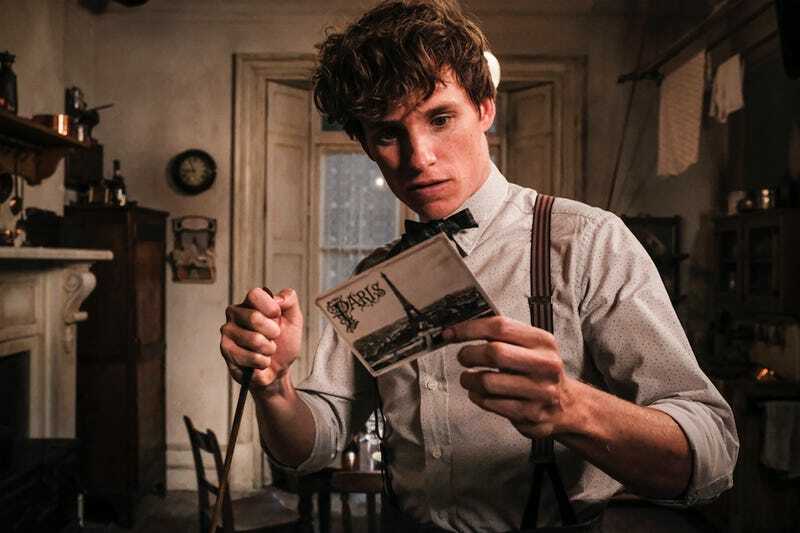 With the bad guy off to Paris to gather forces, “Magizoologist” Newt Scamander, the foppish dandy of a protagonist Eddie Redmayne played last time around, is reluctantly drafted into the Potter universe’s eternal struggle between good magic and the dark-arts kind. On the bright side, this field trip will allow Newt to catch up with magical law-enforcement officer and love interest Tina Goldstein (Katherine Waterston), who’s chasing Credence (Ezra Miller), the young, troubled conjurer who apparently didn’t perish in the climax of the last installment. Also along for the ride is befuddled, doughy, human audience-surrogate Jacob Kowalski (Dan Fogler), still smitten with Tina’s bubbly telepath sister, Queenie (Alison Sudol). That’s not quite the half of it. Beyond reuniting the core Fantastic Beasts posse, The Crimes Of Grindelwald pulls in a crowded new ensemble of supporting witches and wizards, some less new than others. Does “Lestrange” ring a bell? Zoë Kravitz plays Leta, a distant relative of that Potter adversary; engaged to be married to Newt’s Ministry golden-boy brother, Theseus (Callum Turner), she’s less a character than an open question of allegiance. Likewise, Claudia Kim has been cast as a glorified plot twist, the revelation that henchsnake Nagini was once human at least half the time. This is the kind of movie, in other words, that treats the dramatic uttering of surnames as plot turns. The film’s most notable addition, of course, is Jude Law as future Hogwarts headmaster Albus Dumbledore, strapping and only marginally bearded in his youth. Canonizing through implication her previous revelation about the character’s sexuality, Rowling strongly suggests that Dumbledore’s refusal to directly confront Grindelwald might be tied to a more-than-platonic history between them. (“We were closer than brothers,” he insists, and flashbacks hint further.) But if that’s the closest the film has to a compelling tension, it’s more subtext than subplot; maybe they’re saving the true ex-lover fireworks for one of the next three sequels. All of the Potter films found fun around the edges of their stories, in the mechanics and bric-a-brac of Rowling’s hidden magic subculture. Curiously, The Crimes Of Grindelwald barely delivers even on that front, squandering the possibilities of a new European metropolis to reimagine at the flick of a studio-budget wand. (For side color, the film relies almost exclusively on its CGI menagerie, a less imaginative-than-usual collection of eponymous critters, cute or gnashing as needed.) Maybe the crucial sense of discovery was tied more inextricably to age—the characters’, not the audience’s. Part of the reason the Potter books and movies resonate with young readers is that they offer a funhouse reflection of actual adolescence, filtering rites of childhood passage and the social Olympics of school through puckish fantasy. No wonder the best films in the series— Alfonso Cuarón’s energetic Prisoner Of Azkaban, Yates’ brooding Half-Blood Prince and haunted Deathly Hallows: Part 1— are the ones that put hormones and growing pains at center. Following as it does a Hogwarts alum, among other grownup dullards and professionals, the Fantastic Beasts movies mute the childhood wonder and terror of Rowling’s work. They also have a bit of a hero problem, don’t they? Harry Potter, for all his nice-kid incorruptibility, looks downright four-dimensional compared to Redmayne’s milquetoast Newt—an impossibly twee soul with few discernible flaws or even particularly interesting characteristics. “I don’t do sides,” he tells his brother early on, his aversion to conflict barely passing for a conflict. If this overplotted, underwhelming sequel is “about” anything beyond its bottom line, it’s the danger of neutrality during an era of creeping fascism—a theme that resonates both with the film’s historical timeframe and our political now. By the last act, when the melodramatic backstory has begun arriving via an unbroken jet-stream of exposition, the script has envisioned Grindelwald as a charismatic totalitarian, stoking fear and hatred of the human “other” at a literal rally. Politically, it’s on-point, on-the-nose, and in line with Rowling’s vocal rebukes to Trumpism. Dramatically, it’s thin, because the film makes the one significant defection to the dark side feel like a byproduct of story necessity, not credible motivation. Newt, meanwhile, never conveys anything resembling an impure impulse. He’s as tame as the cuddliest beasts stuffed into his suitcase, and even less fantastic than the series he headlines.